In a very rural area of central Mexico, we stopped to eat at an open air kitchen, where trout fresh from a nearby stream were pan-fried on a wood stove. As we waited for our food, I looked across the room and saw this scene of light and beauty in mere cooking tools. Colored pencil on UArt 800 paper. Exhibited in UArt Open, 2012. 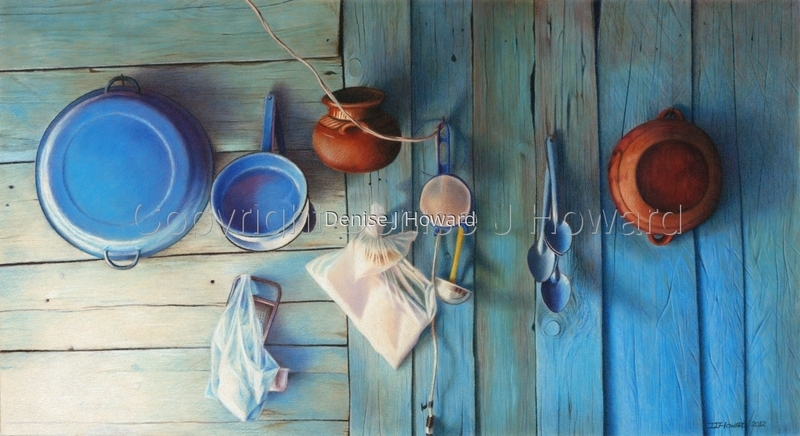 Honorable Mention, Coastal Arts League Annual Juried Exhbition, 2012. Finalist, Richeson 75 Still Life & Floral online exhibition, 2014. 5" x 9.125"8" x 14.625"11" x 20.125"